Stocks were back on sale Tuesday when the S&P 500 suffered more than a 1.40% decline by the closing bell. Some market prognosticators pointed their fingers at the dollar, other pointed at the Korean situation, and still others had their eyes fixed on Ireland and the Eurozone as potential causes for the sharp selloff. 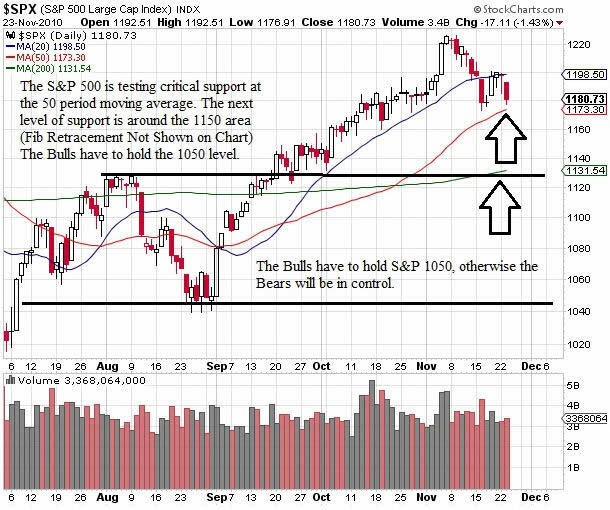 The S&P 500 is currently oversold on the short term chart and either a bounce or period of consolidation is likely. At this point, chasing stocks in either direction will only satisfy the desires of the smart money, who will likely blow these anticipatory traders into trading fodder in coming weeks. Right now, patience is a must. The day before Thanksgiving is synonymous for light volume as are most days preceding a holiday. Thanksgiving leads us into the holiday season which typically is characterized by low volume until after the New Year. As most traders know, when volume is light the market typically has a positive bias. I would not be shocked to see U.S. stocks attract a bid on Wednesday and/or Friday. While the short term charts are oversold, the longer term charts continue to have a technical bias to the upside assuming the 50 period moving average does not get violated. Time will be the final arbiter as to whether this correction is relatively mild before stocks continue higher, or if this is the beginning of a larger correction. 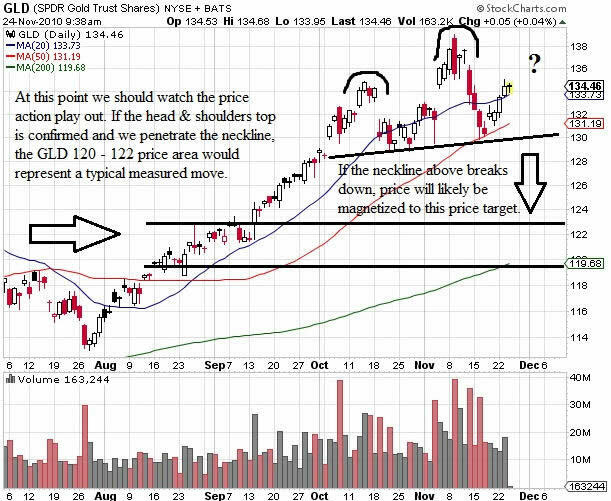 At this point in time, gold is forming a possible head and shoulders pattern on the daily chart. While it is too early to determine if the pattern will play out, if the expected price action confirms the head and shoulders top then the measured move would indicate price levels around the GLD 120-122 area will likely be revisited. Currently gold is not offering a great risk/reward entry from a long or short perspective, and even if it were I would simply watch the action unfold until we get confirmation that the head and shoulders pattern is going to either be confirmed or fail. Caution is warranted and risk remains high. 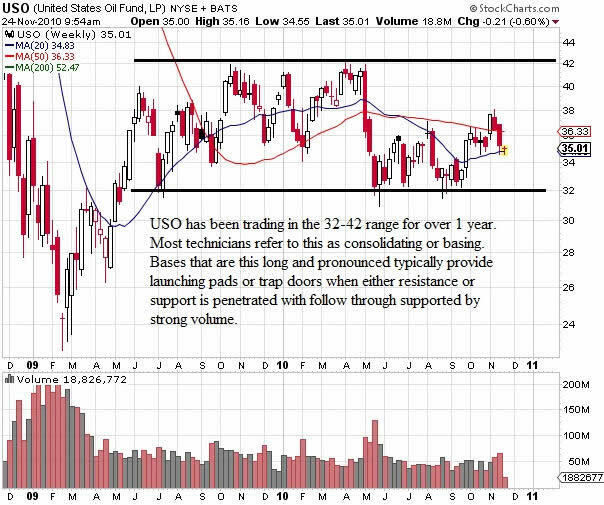 USO has been in a consolidating pattern for well over a year and it continues to build this monster base between the 32 – 42 price levels. When this base is finally broken, a major move in oil will likely be underway. I am expecting that price will get close or test the bottom of the range for an outstanding low risk long entry using the bottom of the base as a backstop for risk definition. It is hard to say where price is heading in the short term, but from a fundamental perspective oil has some positive bias with increasing demand coming from emerging markets and a slowdown in future supply. Recently the XLF ETF (the financials) had a breakout of a long-term consolidation pattern which has failed. With that failure, the broader markets have sold off from recent highs. If the XLF and KRE continue to be under pressure, it is unlikely that the broader market as a whole will continue higher. It is critical for traders to follow the financial sector because the broad markets will go nowhere without their participation. Like it or not, our financial complex has to be healthy in order for our economy to improve with any lasting effect. If banks are not lending, then it is safe to say the economy is not expanding at a fast pace. If the banks are not profitable or are not consistently growing their revenues, this would again be a negative indicator regarding economic growth. There are a lot of analysts who are showing concerns over future profitability amid countless issues which include mortgage defaults, over exposure to commercial real estate and development loans, and potential prosecution in lieu of the way the large money-center banks handled foreclosures. Additionally, companies like PIMCO and other investment firms are attempting to return the mortgages they bought back to the banks through legal action which could lead to further losses. 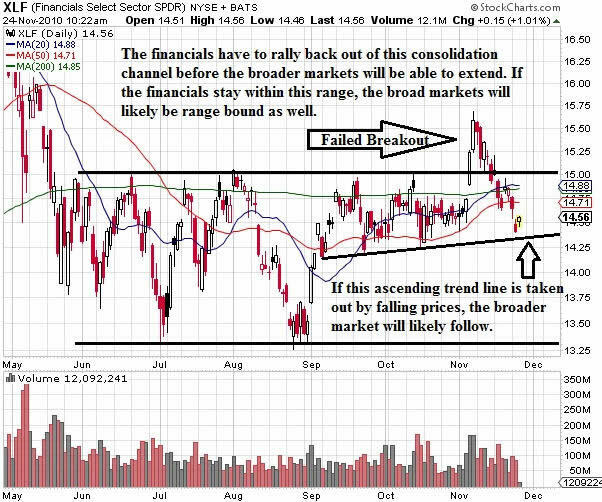 While the outlook is certainly not great, I would not expect any powerful rallies if financials are not following along. With the shortened holiday week, I will not be offering an option trading setup. I am simply watching the price action and sitting in cash. When volume is this light, the markets generally have an upward bias and with the large selling volume we witnessed on Tuesday, a bounce is likely overdue. Until the S&P 500 gives up the 50 period moving average, we remain in a technically constructive pullback which could potentially lead to higher prices. If we get a daily close on the S&P below the 50 period moving average, all bets are off. In closing, I hope this find you well and I wish all of you and your families a safe and Happy Thanksgiving!